Author of "Smart Mom, Rich Mom"
The following post is adapted from SMART MOM, RICH MOM: HOW TO BUILD WEALTH WHILE RAISING A FAMILY, which was published this week. The path to becoming a smart mom starts long before the birth of your first child, and even before the double lines of a pregnancy test appear. Just as prenatal vitamins help us build our reserves of iron and folic acid, certain money habits adopted early make us stronger and better prepared for the financial shock of family life. Many of the moms I interviewed for my new book, "Smart Mom, Rich Mom," had been saving money since their first job, practicing frugal habits until they become second nature, and even making investments while still in their twenties with their futures in mind. When I asked two moms--both lawyers in their mid-thirties who earn the biggest paychecks in their marriages and who have seven kids between them--just how they got so comfortable with money, they talked about the first jobs that they held as teenagers. One of them had just explained to me how she negotiated a signing bonus worth twice as much as a luxury car. She said that as the daughter of parents of modest means living in the affluent suburbs of Washington, D.C., she started working at a dry cleaners to earn spending money. The other lawyer, Lindsay Kelly, shared a similar story. Growing up with parents who never completed high school, she committed herself to success early and started by working at a Subway as a teenager. She balanced her mom's checkbook for her and convinced her parents to take her to Disney World in tenth grade by creating a budget on her own and showing it to them. She also handles the money and investments in her own house- hold--her husband, she says, doesn't keep track of what bills are due and when, and which account to use to pay them. Neither woman could remember their parents explicitly discussing money with them, but both watched their parents work hard and live within their means. They both wanted more for themselves and their own families--success, money, prestige-- and they embraced that ambition fully, and today both women are reaping the financial benefits. They ask for more money when they take new jobs, invest aggressively for their future goals, and save more than they earn--habits they've been practicing since they were teenagers. They don't waste time worrying whether they are "worth" their high incomes or whether they deserve the financial security that they've built, and they don't hand over money management to their husbands. They just do it themselves, without reservations. For many moms, though, our relationship with money is as complicated and fraught as how we feel about our bodies. We have dark issues we have to work through, some of which date back to childhood and how we watched our own moms manage, or not manage, their finances. My interviews with even the most successful moms--women I see as role models--showed me over and over again how women sometimes have to go through extreme financial hardship before finding their way. Gail Sheehy, author of the bestselling book "Passages," recalls living off of spaghetti for weeks on end when she was a working journalist and single mom in her twenties and early thirties, as she started to write what would become her bestselling (and high-earning) book. "Being a single mom in the 1960s was not cool, and I was too proud to ask for alimony," she says. "I really had to assume the breadwinner role for my daughter and myself," she says. She paid $139 in rent a month and hired a housekeeper who also served as a surrogate mother to her young daughter as she traveled for her reporting. She estimates that she lived on about $15,000 for two years. "I ran out of money," she recalls. That all changed with the publication of "Passages," which sold millions of copies around the world. She bought what was then an inexpensive old farmhouse in East Hampton for herself and her daughter, where they would take refuge for the next thirty years, before she sold it for a hefty profit. While she's faced other financial challenges, most notably when she scaled back her work to care for her ailing husband, Clay Felker, Sheehy, now in her mid-seventies, enjoys relative financial security from her book earnings as well as the fact that she continues to work, well past what most people consider to be retirement age. 2. Identify your current short-term and long-term savings goals. Do you know what you're working toward? Spelling it out helps provide the motivation needed to get there. 3. Cultivate feelings of gratitude and abundance every day. Take a moment to appreciate the material and nonmaterial gifts in your life. 4. Age your face and spend some time with your older self. You can do this with an app like AgingBooth or online--a web search of "aging face websites" will bring up the latest tools available. 5. Call an older woman in your family to talk about herlife's money lessons. Ask her questions about tough financial times she experienced, money regrets, what she did right, and how she learned her own spending and saving habits. 6. Reflect on your own feelings about managing money and what early money experiences might be influencing them. Do you remember how your parents discussed money in front of you growing up? 7. Embrace your role as chief financial officer of your life by setting aside time every few months to review your current financial accounts, your long- and short-term goals, and the steps you need to take. Develop your system for tracking and storing financial paperwork. 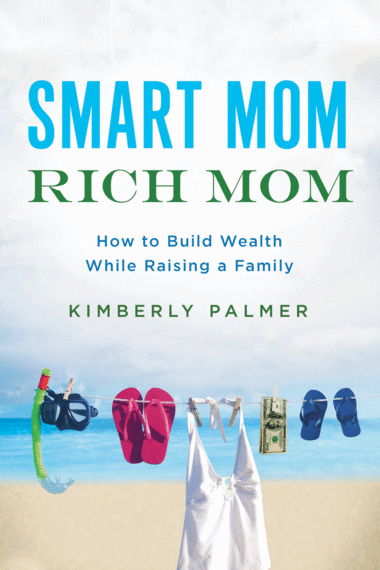 Excerpted from "Smart Mom, Rich Mom: How to Build Wealth While Raising a Family," by Kimberly Palmer. © 2016 Kimberly Palmer. All rights reserved. Published by AMACOM Books, www.amacombooks.org. Division of American Management Association, 1601 Broadway, New York, NY 10019.